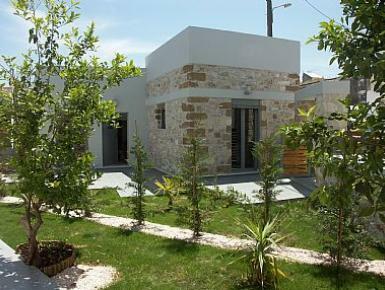 The villa is situated in the heart of Pigi village, only meters from the village square. Pigi is a traditional working village that has changed very little over the years. Although close to the tourist areas it has retained its characters and offers all those who visit it an opportunity to experience the true Cretan lifestyle. Wandering around the narrow streets of whitewashed houses you sense that you have stepped back in time. To time when life was so much more relaxing than today. For all its natural charm and beauty, Pigi is well equipped to cater for all its visitors. There are two mini markets, a pharmacy, butcher, bakers and two tavernas who serve traditional Cretan food. Buses for the town of Rethymno pass through the village every hour. The village has easy access to both the local beaches and the highway, making traveling to either of Crete’s airports, and in generally to explore the island, very easy indeed.